USL (United Sales Ltd) is a company of Dawlance Group. USL launched its Shariah Compliant Instalment Sales Solution in accordance to the Islamic Laws, under the brand of “Diyanat Financing”. With this launch, USL has become the first installment sales company in Pakistan to offer Shariah compliant solutions to the public. USL has signed an agreement with Meezan Bank Ltd to provide documentation, process review, research & training and advisory services to USL for development and launch of Shariah compliant instalment sales solutions. USL is providing its other sales services since 1997. This post is only for the awareness of our readers about this offer by USL. But we don't have any link with USL. So please contact with us for any query about this offer. Only contact with your nearest USL shop or dealer. 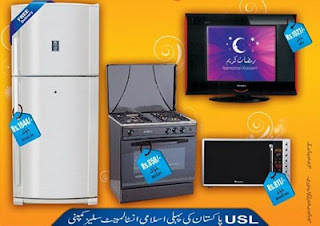 USL offers a wide range of home appliances e.g. Refrigerators, Deep Freezers, Air-Conditioners (Split and Windows), Washing Machines, Micro-Wave Ovens, Televisions and LCD TVs, Electric Generators, Gas Appliances (Ovens), Water Dispensers, as well as Motor Cycles. Besides Dawlance, It also offers products of other top selling brands of Pakistan e.g. Samsung, Nobel, Orient, nasgas, DYL, Super Power and JASCO. USL also offers Jahaiz Packages (Marriage Dowry Packages). There are 4 packages are available with a slight difference of models and products. 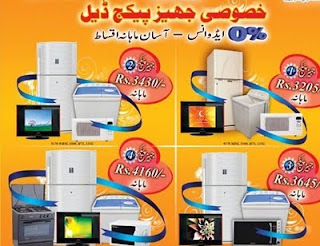 Jahaiz Package includes Refrigerator, Washing Machine, Microwave oven and LCD TV. USL offers a wide range of payment options according to the ease of customer in 6 months, 12 months, 18 months and 24 months. Just pay your first installment and get your product. There are no down payments or any other hidden charges. You can also buy products on cash payment. USL offers various free gifts with almost every product, when you buy it on installments. USL offers 24 hrs free delivery, but I am not sure that whether it is limited to some cities or it really means that delivery is free in whole Pakistan. If you know about it please share your knowledge in comments. Contact to any of your nearest USL (United Sales Ltd) Shop or USL Branch or USL Authorized Dealer. Till now USL has its branches only in Karachi.